My String Cheese Manicotti is hands down the easiest way to fill manicotti! String cheese is stuffed into each pasta tube before being covered with a meaty marinara sauce – an absolute pasta and cheese lover’s delight! Original content posted April 2017. Updated February 2019. Manicotti tends to be so time consuming. And messy. Don’t get me wrong, it’s absolutely delicious but the prep work to get to the insanely delicious end result tends to make everyone think twice before adding it to their dinner menu. But what if there was an easier way to get manicotti to your dinner table? 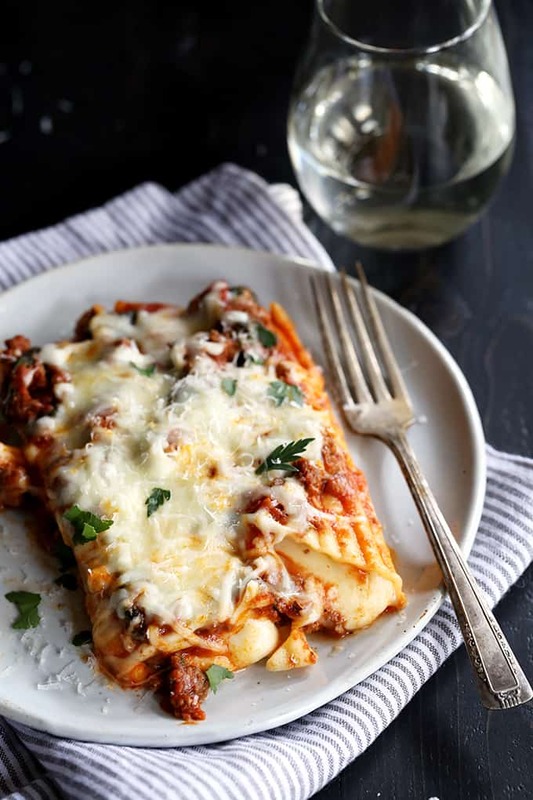 Prepare to celebrate my friends, my String Cheese Manicotti is the answer to your how to stuff manicotti without making your kitchen a disaster dilemmas! Like many of you, we typically have string cheese in the fridge for a healthy snack option. In fact, we have an entire bin of cheese in our fridge, but that’s a topic for another day. Those seven years we lived in Wisconsin might’ve rubbed off on me. When peering in the fridge one afternoon as I attempted to come up with a dinner idea, the proverbial light bulb came on. Why not stuff one of my favorite pastas with string cheese instead of the typical messy filling that you have to spoon or pipe into each tube? 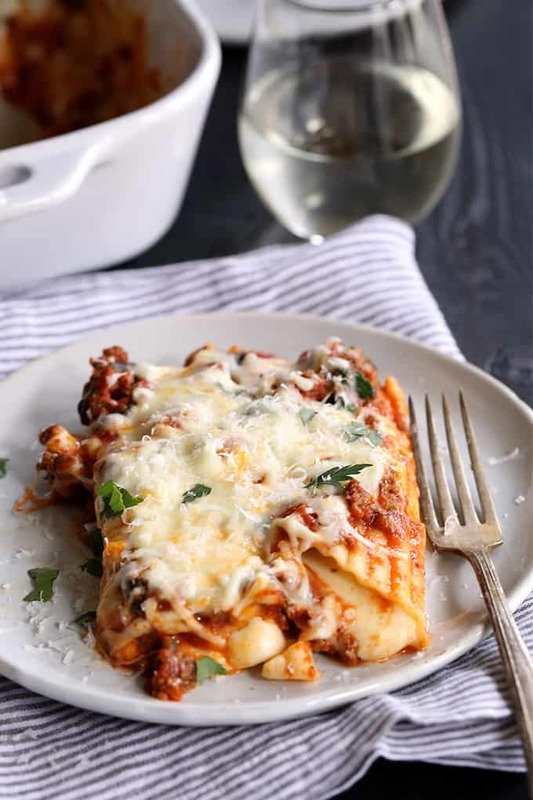 My String Cheese Manicotti is hands down the easiest way to fill manicotti! 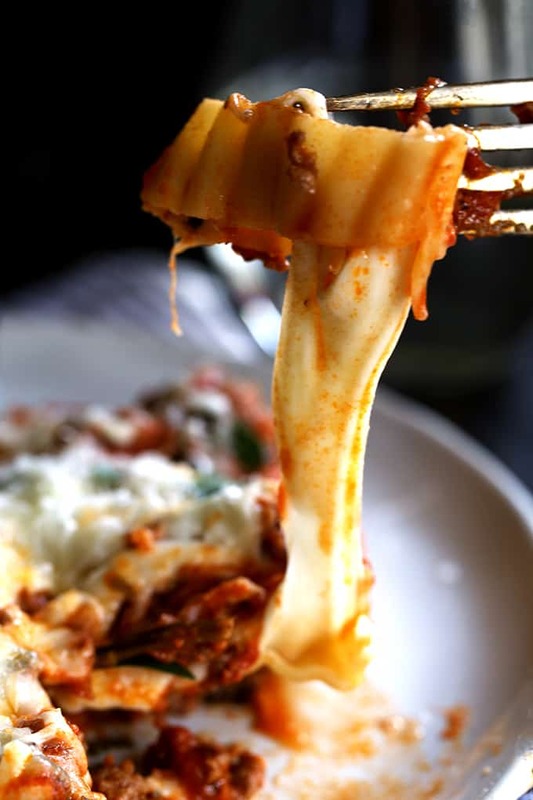 A piece of string cheese is stuffed into each pasta tube before being covered with a meaty marinara sauce. It’s all then covered in another blanket of mozzarella cheese and baked until bubbly. A garnish of chopped parsley and a shower of Parmesan cheese makes this an absolute pasta and cheese lover’s delight! This String Cheese Manicotti is the absolute answer on how to stuff manicotti without you or your kitchen wearing half of the filling. Now you can enjoy your favorite pasta at home quickly and easily any day of the week. Talk about winning! I’m kind of kicking myself for not having this revelation years ago! If you’re looking for other delicious weeknight pasta dishes, I can’t recommend my Quick and Easy Spinach and Ravioli Lasagna, Lemon Arugula Pasta and One Pot Sausage and Peppers Pasta enough. They also happen to be some of the most requested dinners by our 9 year old daughter. She definitely inherited her love of pasta from her mama! Cook manicotti according to package directions. Meanwhile, add ground beef and onion to a large skillet. TIP: To insure the pasta won’t be mushy after the manicotti bakes, I prefer to under bake my manicotti by a minute or two. Brown beef and onion over medium heat until meat is no longer pink. Add marinara sauce, garlic powder and Italian seasoning to skillet. TIP: If you are using ground beef with a higher fat percentage, be sure to drain the beef of any excess grease prior to adding the marinara sauce. 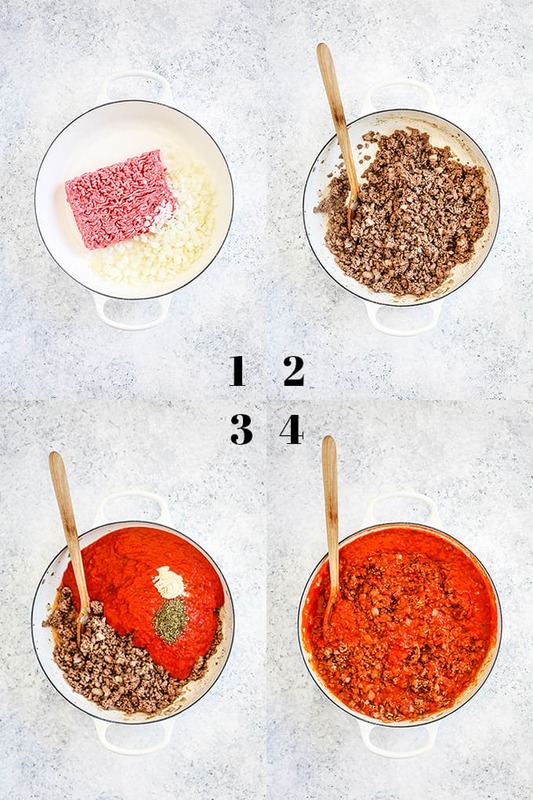 Spread half of meat sauce onto the bottom of a 9″ x 13″ baking dish. 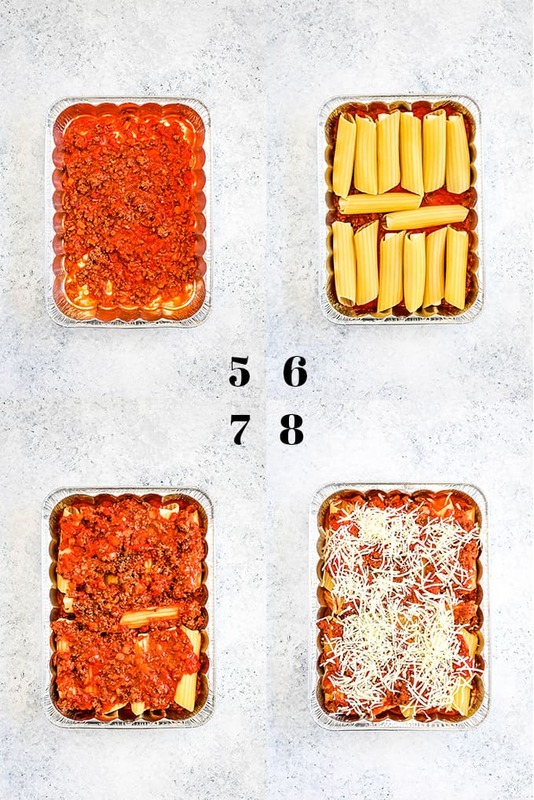 Stuff each manicotti shell with a piece of string cheese and arrange in a single layer in baking dish. Top manicotti with remaining meat sauce. Bake at 350 degrees for 25-30 minutes or until bubbly. Sprinkle with mozzarella cheese and bake an additional 5-10 minutes, or until cheese melts. Garnish with chopped parsley and Parmesan cheese, if desired. If you’ve tried this String Cheese Manicotti or any other recipe on Melanie Makes, please let me know your thoughts in the comments below. I love hearing from you and respond to each and every comment! Cook manicotti according to package directions. Meanwhile, add ground beef and onion to a large skillet. 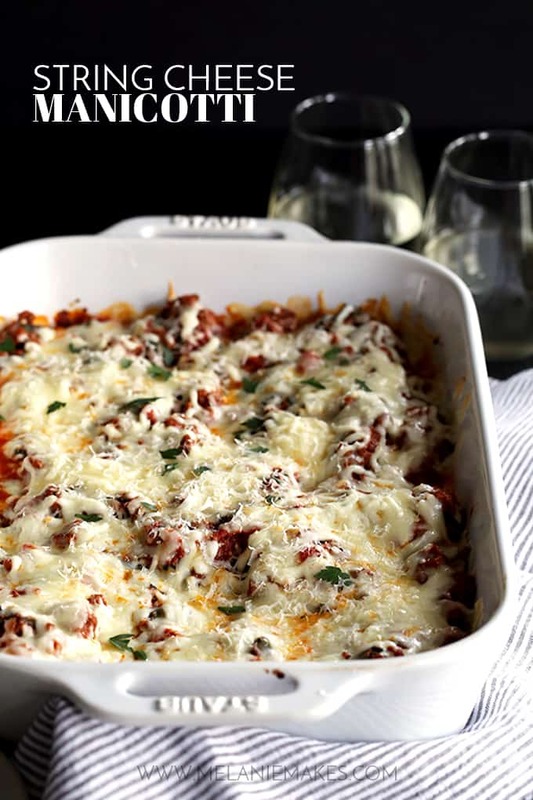 Sprinkle with mozzarella cheese and bake an additional 5-10 minutes, or until cheese melts. It's always a guaranteed hit at our house! 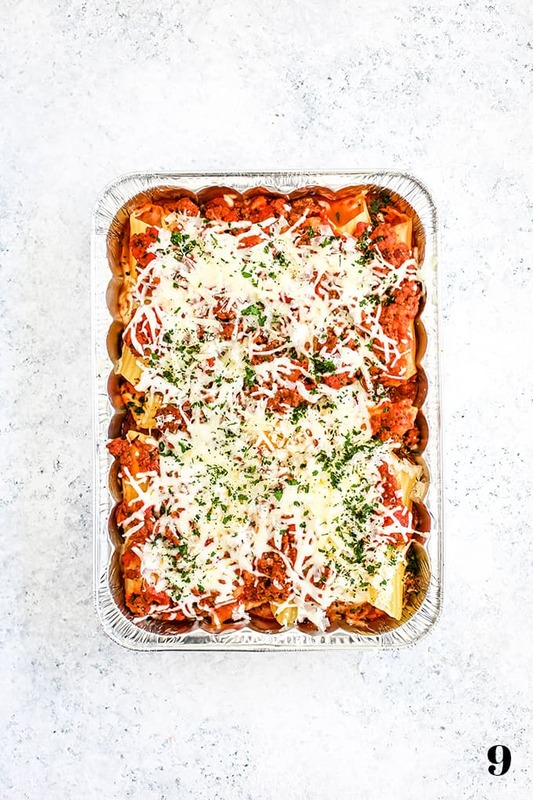 This baked pasta is calling my name! This recipe looks delicious, can't wait to try it! 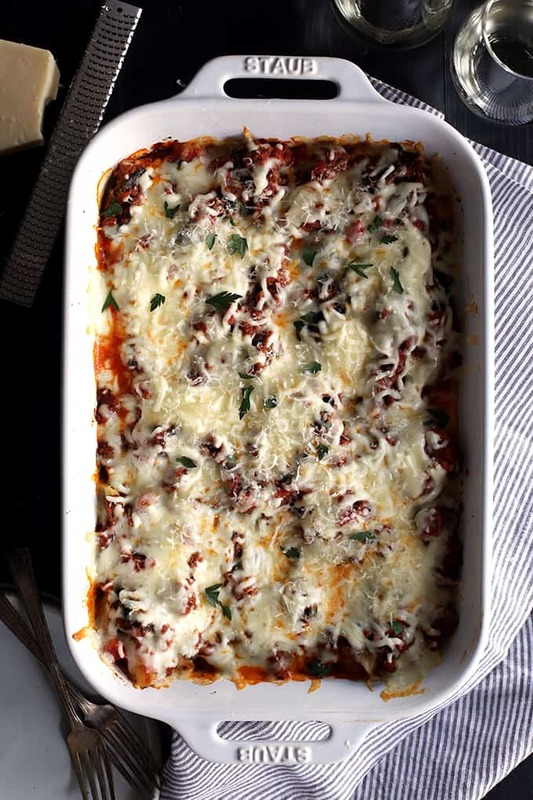 This manicotti casserole would be a perfect Sunday dinner. This is in our future! So easy and delicious! Such a great idea for a Sunday dinner! I've made this several times, and it is always fast and wonderful! So glad to hear you enjoyed it, Mahy! thank you for this quick and easy recipe for my picky eater he said it was delicious and as fast as I put it on the table for the rest of the family it was gone. The best compliment ever, Chrissie! Do you use a whole piece of string cheese per shell or how many pieces do you cut the string into and then how many pieces per shell? Hi, G - You use two whole string cheese per manicotti shell. No cutting involved! I found that the noodles don't even needs to be boiled ahead of time or before stuffing. Just stuff with string cheese , cover with spaghetti gravy (sauce) and cover with foil and cook about 30-40 min. Viola! Done! So good. I use the same method making lasagna also. Don't you love how easy the string cheese makes everything, Donna?! This looks like a perfect dinner my family would enjoy! Can't wait to try! Oh YUM! I love manicotti and the string cheese is brilliant! that's really clever! my boyfriend likes to say his favorite kind of cheese is "string." Wow!! This is the best manicotti dish!! Looks and sounds amaaazing!! Okay this is seriously GENIUS! Stuffing manicotti is the worst, and this takes all the hassle out of it! 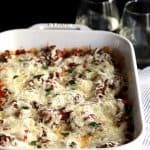 I always avoided making stuffed shells because it is so darn hard! This is such a great idea! Whaaat? This is the best idea ever! I hate the mess of stuffing manicotti but it's one of my favorite pasta dishes, Thanks!